Chronic neck pain is very common throughout the United States, and in many cases, it can stop people from living a full and healthy life. Doctors have revealed that 7 out of 10 people will experience neck pain at some point in their lifetime. Whether you have neck pain after suffering from an injury, poor posture or if you have neck pain because of an illness, Chiropractic care is proven as an effective treatment options for neck pain relief. In fact, research has shown that patients with chronic neck pain that participated in clinical trials discovered significant improvement after receiving chiropractic spinal adjustments. A neck adjustment, also known as a cervical manipulation, is used to restore mobility to the joints in your neck and spine that have been restricted by tissue injury caused by a traumatic event. For example, if you were in a car accident and are suffering from whiplash symptoms, adding weekly neck adjustments into your treatment plan can increase your range of motion and speed up the recovery process. When it comes to chiropractic care, there are many treatment options for you and your chiropractor to choose from in order to achieve optimal health while reducing pain symptoms. Depending on your condition (i.e. whiplash, disease, poor posture and bad habits,) your treatment plan is tailored specifically to your needs. Instrument-Assisted Manipulation – This technique uses a hand-held tool to help your chiropractor apply force without thrusting into the spine. Specific Spinal Manipulation – By using a gentle thrusting method, this technique helps restore joint movement. Flexion-Distraction Technique – This method uses a pumping technique that is used on the intervertebral disc rather than using direct force. Manual Joint Stretching and Resistance Techniques – This can help diminish neck pain and other symptoms. Trigger Point Therapy – This technique is used to allivaite tight, painful points on muscles within your neck. Ultrasound Therapy – This is a method that uses very high frequency sound waves to stimulate the neck tissue beneath the skin’s surface. This can help reduce pain and stiffness in your neck. Therapeutic Exercises – Techniques used to help improve overall range of motion in your neck and hinder neck pain from progressing. Electrical Muscle Stimulation (EMS) – This is a machine that uses low frequency electrical currents that cause the muscles in your neck to contract. Chiropractic care is increasingly gaining popularity among patients throughout the United States because it offers natural, safe and non-surgical treatment options that can help reduce your neck pain symptoms. Not only can chiropractic care relieve your neck pain symptoms, but it can also help you get your overall health and well-being back. Don’t let your neck pain take over your life! 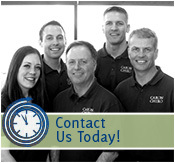 If you have any questions about Neck Pain relief, call Caron Chiropractic Clinic today at 651-255-9999. This entry was posted	on Thursday, May 29th, 2014 at 8:43 pm	and is filed under Chronic Pain, Neck Pain. You can follow any responses to this entry through the RSS 2.0 feed. You can leave a response, or trackback from your own site.